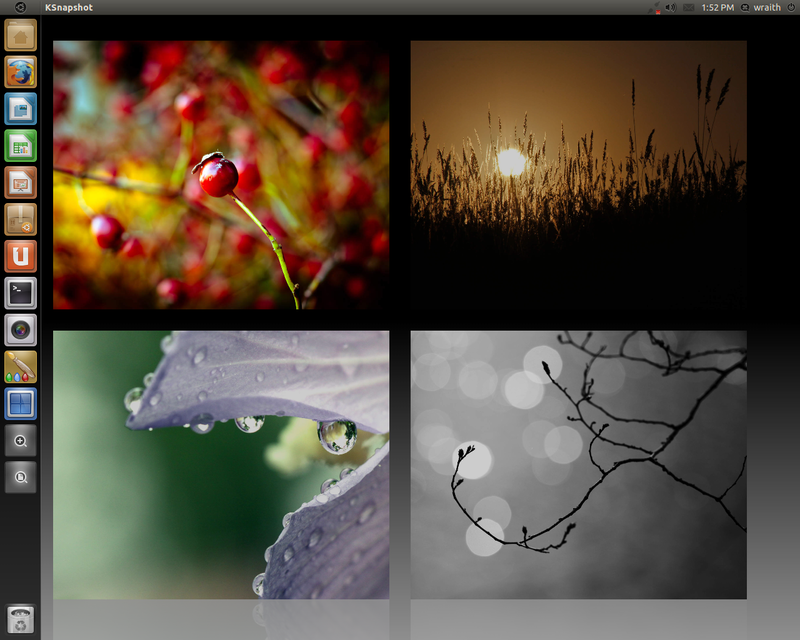 Different wallpapers is a cool feature in Ubuntu desktop that implemented by Compiz. While Ubuntu 10.10 Maverick release, for some reason different wallpapers in different workspaces doesn’t work like older Ubuntu edition. 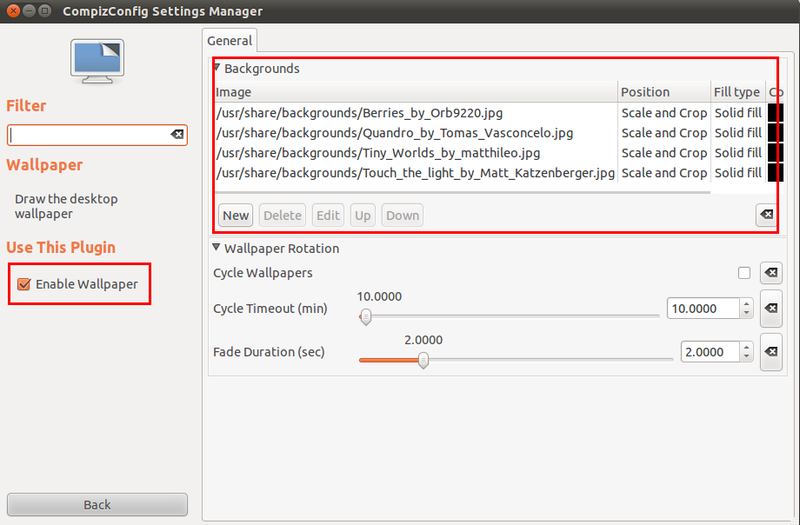 Now, this feature come back in Ubuntu 11.04 Natty, and following is how to enable it in Ubuntu Natty Unity desktop. 1.) Disable Desktop Icons. After this step, icons and right-click menu on desktop will go away. Instead, you can find them use Home Folder in Unity Launcher or install cario-dock Mac style launcher. Press Alt+F2 key combination and type gconf-editor in “Run a command” box. In next window, navigate to “apps/nautilus/appearances” and un-check “show_dekstop” in right. 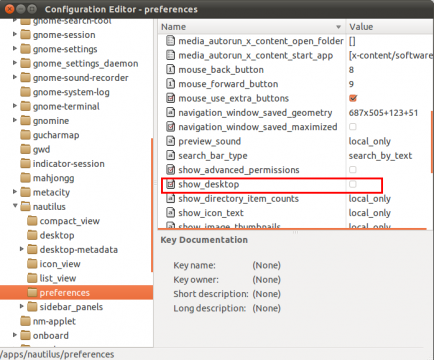 UPDATE: Ubuntu 11.10 Oneiric install and then launch Gnome Tweak Tool (Search “Advanced Settings” in Ubuntu Software Center), and turn off “Have file manager handle the desktop” in Desktop tab (See this post). It needs compiz-fusion-plugins-extra installed if you can’t find Wallpaper in CCSM. 3.) 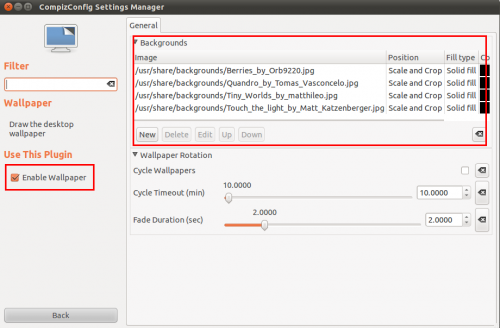 Launch CCSM (compizconfig-settings-manager), enable Wallpaper and click to get into its configuration page to add background images for Ubuntu workspaces. Done! The Unity panel may mess up after these steps, it’ll back to normal at next login. 4 users responded in " Ubuntu 11.04 Unity enable Different Wallpapers in each workspaces "
I’m using ubuntu 11.10 and I had some trouble to make it work because all the faces of my cube were black even if I put 4 images in the ccsm. I figure out that images needed to have a size of 2048*1024 (size of my resolution). For anyone who have the same problem I had, just resize your images and it will work with all the explanations given on this forum. This may be why you updated this page  to suggest using gnome tweak tool.